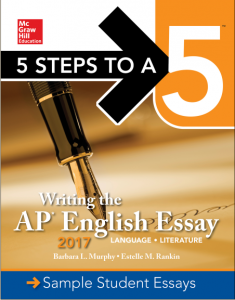 5 Steps to a 5: Writing the AP English Essay 2017 provides strategies for writing a standout essay on the Advanced Placement exams, along with an abundance of essay-writing practice. This logical and easy-to-follow instructional guide uses the effective 5-step study plan to build the skills, knowledge, and test-taking confidence students need to reach their full potential. Written by an AP reader and an AP teacher, this insider’s guide clearly explains exactly how to receive high marks from graders by planning, prewriting, writing, and reviewing your essay. The 5 Steps to a 5: Writing the AP English Essay 2017 is an effective 5-step plan breaks down test preparation into stages: 1. Set Up Your Study Program 2. Determine Your Test Readiness 3. Develop Strategies for Success 4. Develop the Knowledge You Need to Score High 5. Build Your Test-Taking Confidence.